“I find myself inclined to set down for whomever, before my memory goes kaput altogether, some account of our little community, in particular of what Margie and I consider to have been its most interesting hour: the summer of the Peeping Tom.” Something has disturbed the comfortably retired denizens of a pristine Florida-style gated community in Chesapeake Bay country. In the dawn of the new millennium and the evening of their lives, these empty nesters discover that their tidy enclave can be as colorful, shocking, and surreal as any of John Barth’s fictional locales. From the high jinks of a toga party to marital infidelities, a baffling suicide pact, and the sudden, apocalyptic destruction of the short-lived development, Barth brings mordant humor and compassion to the lives of characters we all know well. 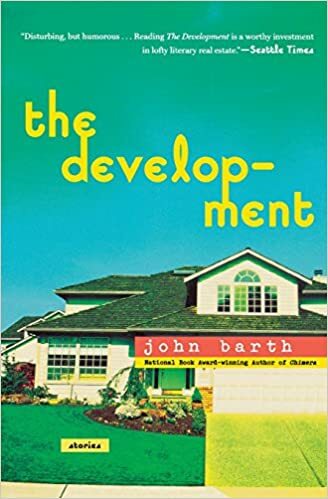 From “one of the most prodigally gifted comic novelists writing in English today” (Newsweek), The Development is John Barth at his most accessible and sympathetic best. it and each other all these years; let's end it peacefully and painlessly before things go downhill, which is really the only way they can go from here. "And let our friends and neighbors and children clean up the mess?" David presses her. "Would you and Pete do that to us?" "Count me out," Peter declares. "For another couple decades anyhow, unless the world goes to hell even faster than it's going now." "In our case," his wife reminds the Bergmans, "it's friends, neighbors, and colleagues.